History from October 07 – July 08. On Saturday 5th July Turn Lyme Green will be hosting events in the town in celebration of its achievements. Over 90% of Local Traders are now committed to the campaign and Lyme is handing out very few carrier bags, and will continue to encourage locals and tourists to Turn Lyme Green and Keep it Clean. 11am – Turn Lyme Green will be celebrating outside Alice’s Bear Shop in Broad Street. They will be speaking about their achievements to date, and what plans are for the future. 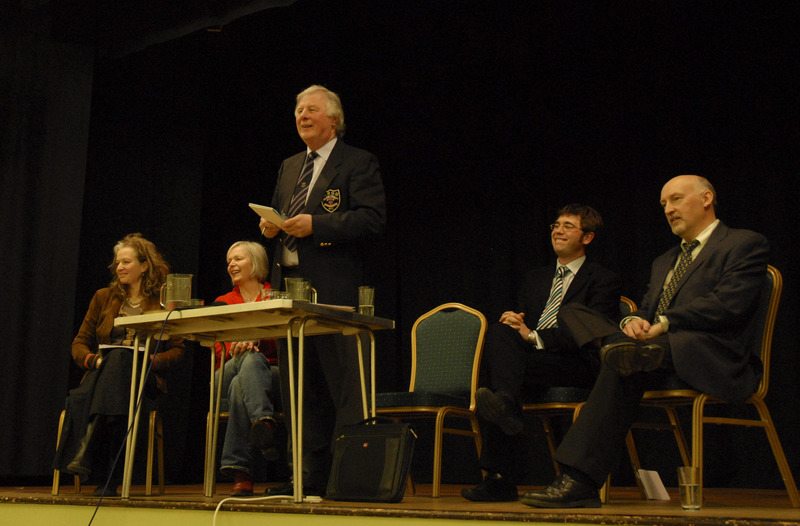 There will also be some of our ‘Silver Greens’ (older’ Lyme residents) speaking about times before the’ carrier bag’. 11am – 3pm – Sew-in at the Shelters. A group of sewers (The Bag Ladies) will be demonstrating how to make your own cloth bag, with public participation. 11am-12 midday – Lyme Youth Theatre will be putting on several performances for the public, including a Poem especially written for today’s event, this will take place also at the Shelters. Traders will be taking part in the day by decorating their shop windows on a GREEN THEME, so look out for those displays. 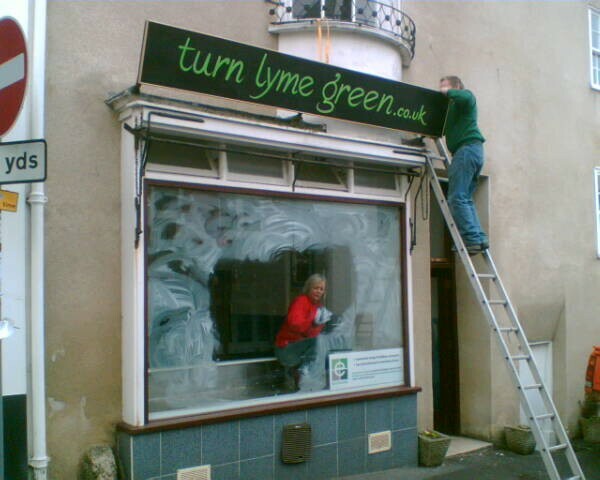 Turn Lyme Green would love to see as many supporters as they can on the day to help them celebrate, and continue to participate in their efforts to look after their environment. Global Warming – how are we doing? Read this article. Any comments? Perhaps it’s time to act together on the global warming issue. if you take a carrier bag of any kind, take responsibility for it’s eventual disposal. re-use plastic bags as many times as possible. Then take them to a recycling facility, such as the one provided by the Co-op in Lyme Regis. legislate to make all plastics bio-degradeable over time. P.S. Whilst using the recycling facility in the Charmouth Road car park today, we saw a man taking garden rubbish out of his car and leaving it behind the recycling bins in black plastic bags. This is fly tipping, and is illegal. We all have to pay the council to clear his rubbish up for him. We are planning an event later in the year at which we hope to announce that Lyme Regis can be officially described as a plastic bag free town. In the meantime, don’t forget to drop in to Charmouth’s bag-free event this coming Saturday 26th. 4RLYMEREGIS – details of the Easter Saturday event available here. It was a great success, thanks to all who gave their support. We are sad to announce the demise of our lovely sign (see picture above) in the Great Blow of 2008. Thanks to Hugh Dunford-Wood for making it. Around the town there will be on-street performances from the Lyme Youth Theatre and the Taiko Drummers. Watch this space for more information about times and places. This is the week our Co-op goes plastic bag free – a big green pat on the back to Iain Ferguson and his team, and to the manager and staff at the Co-op. Please give them all your support and make that extra staff training worth while! The new system will be fully operational from 10th March. If you want to buy a trolley bag, go to the Axminster branch. The Daily Mail has taken up the cause – read their article HERE. And look out for ways you can interact with their campaign, petitions etc. Candida was interviewed for BBC Dorset. Read the article and listen to the interview here. FYI – we are aiming for 22nd March – Easter Saturday – as BAG FREEDOM! We’ll have a series of events and activities and all are welcome. More info to come. With the support of the Wiltshire Wildlife Trust, Tisbury have Binned The Bag. See here. The latest list of traders and businesses in Lyme who support the campaign is now predominantely GREEN. (Check it out!) Traders and Businesses – please keep the support coming! If your name on the list isn’t green, let us know if you would like it to be, OR (and don’t be shy) why you feel happier staying black. We need to take account of all points of view. And by the way, it’s mostly the cafes and restaurants – anyone know why? The campaign is on course to promote Lyme Regis as a plastic-bag free town by Easter this year! We will keep you posted with events and NEWS! In the meantime, don’t put your old bags into landfill – when you have reused them to destruction, save them for us. We have a use for them. All will become clear at the Woodroffe Green Day on Thursday 7th Feb…. The Traders Evening on 28th January, hosted by the Traders Association, with Turn Lyme Green and special guest speakers Iain Ferguson (Co-op Packaging) and John Clarkson (Global Trading UK Ltd) was a great success. A question and answer session provoked an interesting debate, demonstrating that the issue isn’t as simple as banning plastic bags but has the ‘triple bottom line’ message at its core – reduce, re-use, and recycle. For press coverage of the event, click here. Lyme Regis Radio kindly covered the event for us too. You can hear it HERE. 03/01/08 – Happy New Year! ‘You & Yours’ (Radio 4 Thursday 3rd January 2008). The programme has a long article about plastics in the marine environment. To listen to the programme, click HERE. The marine plastics article starts 27 minutes 30 seconds in. (Use the forward/backward arrows top left of the page to select the time.) And don’t forget to turn your speakers on…. The programme describes very clearly the ‘hefty toxic burden’ of small plastic particles and the toxins released in the marine environment, as discovered by Dr Richard Thompson of Plymouth University. Do listen to Marcia Gigg of the British Plastics Federation response to Tom Heep’s questions. Apparently it’s our fault for dropping litter – laughable if it wasn’t so tragic! And listen to Dr Richard Thompson’s suggestions towards the end for things consumers can do. Twelfth Night approaches – when you’ve finished with your Christmas tree LRTC have agreed to do chipping of resident’s Christmas trees – they will collect daily from Woodmead / Hill Road car park for 2 weeks from 7th January. They’ll then compost it. 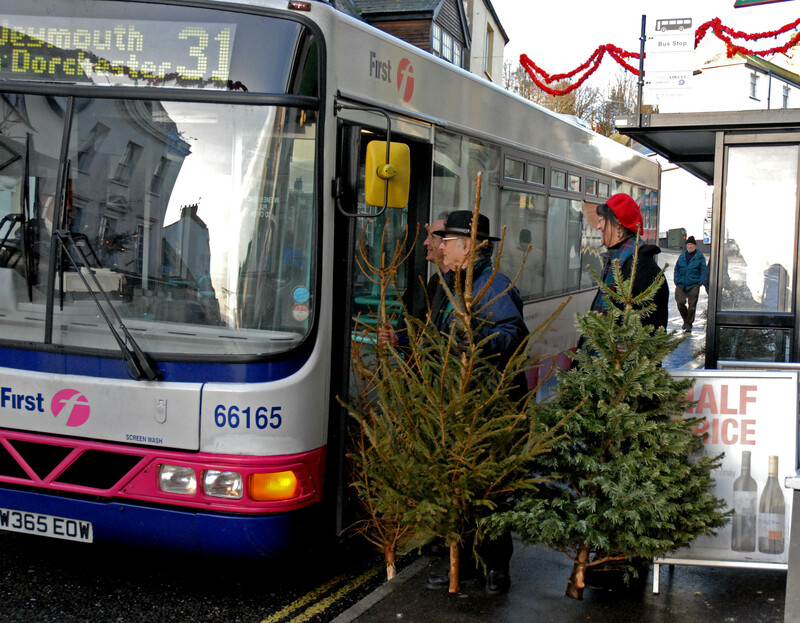 For picture of the ‘Trees On The Bus’ CLICK HERE! Love food hate waste? Have a look at their site HERE. 20/12/07 – If you are the sort of person who likes the balanced view, here are 14 pages of plastic pros and cons: For the British Polythene Industries (BPI) Environmental Facts document, click HERE.For a synopsis from the Packaging Knowledge website, click HERE. 20/12/07 – for a general TLG update see HERE. 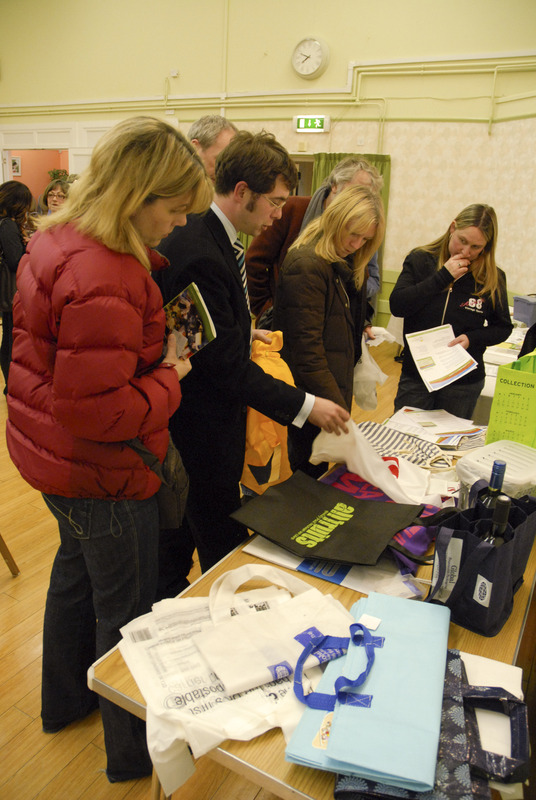 22/11/07 – We are working with various trades associations to develop a strategy to help Lyme Regis go bag free. We had a meeting with the Traders Association last week and the next event will be an evening in early January at the Woodmead Halls to which all businesses will be invited. We hope to have representatives from some of the bag suppliers available to show their products and take your questions. Please keep looking in the press and on this site for further informaton about the date for this meeting. 15/11/07 – There are 3 venues at which residents can claim their free Turn Lyme Green bag if they missed the giveaway at the launch. They are:Acorn (Broad Street), LymeNet (St Michael’s Business Centre, Church Street) and Staples Stores (Staples Terrace). Claim them until next weekend – 25th November. One bag per household. Non-residents can purchase bags from Tourist Information Centre for £1.99. 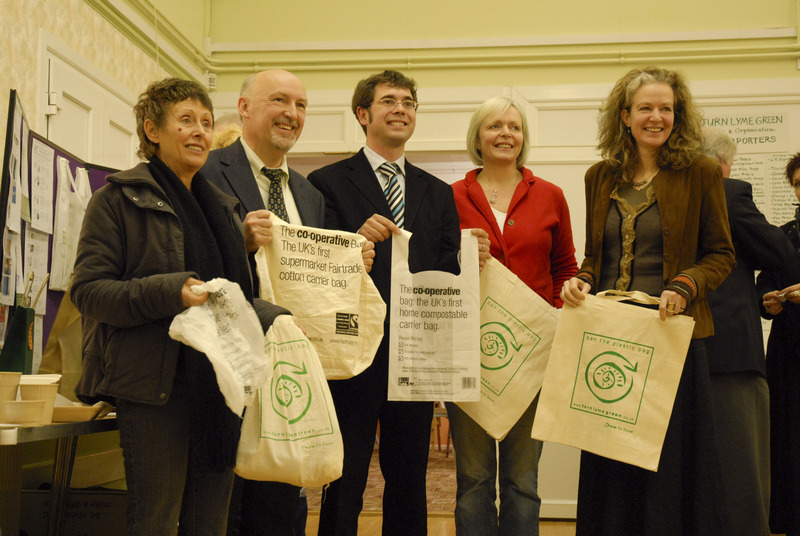 14/11/07 – All of London’s councils have agreed on a ban on plastic bags following a public consultation. See the news piece HERE.Sainsbury’s have today announced they are encouraging customers to re-use their plastic carrier bags. They are also giving a free ‘bag for life’ to customers. Turn Lyme Green feel this is a sideways step. A plastic bag is not a bag for life. We need to vastly reduce the amount of plastic coming into the system and recycle the plastic we have here already.07/11/07 – Read the Western Morning News article HERE. 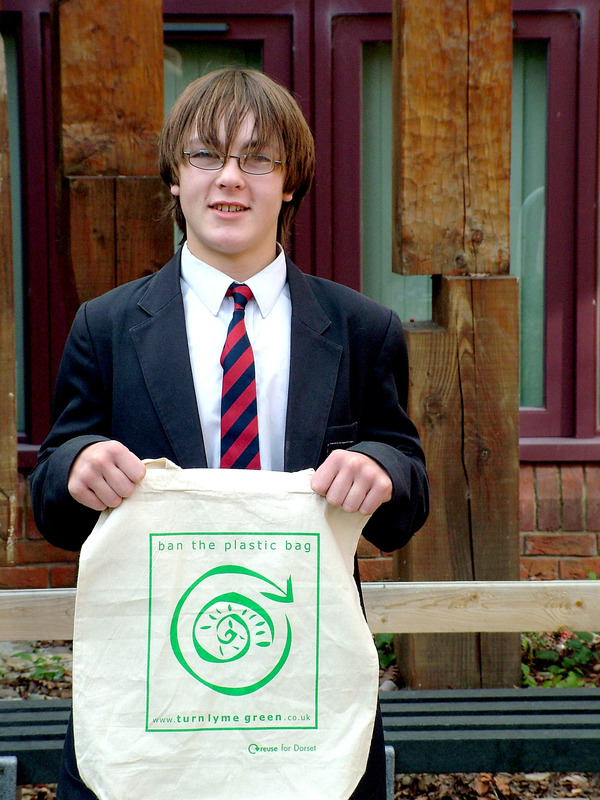 29/10/07 – Congratulations to Jason Dickins, the Woodroffe Student who designed the campaign logo for the bag. See the winning design HERE. The campaign now has a shop window at 35 Coombe Street, Lyme Regis, where you can see examples of plastic-free shopping bags and food packaging, plus lots of other information. The shop front has been loaned to the campaign by Ecodeveloper Ltd.